One of the easiest ways to render your computer unusable is to mess with the operating system's files and settings--one accidental deletion of a single file can require a complete reinstall of Windows and all of your applications. To protect users, Windows hides important system files and folders, thereby preventing accidental deletion and modification. It also enhances the readability of file listings by hiding known file extensions (such as .xlsx for Excel files or .docx for Word files) so that it’s less confusing for you to find what you’re looking for. However, in some instances you want to see certain system files and folders (such as when you have to troubleshoot a problem), or you need to confirm a certain file's type (to be sure that you have the right one). Windows offers an easy way to reveal hidden system files or file extensions. Here’s how to do it. You may need to enable the Folder Options tab. 1. 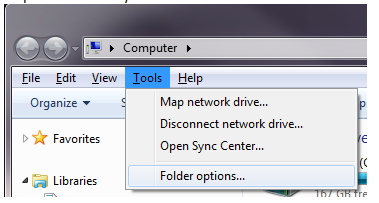 Click Start, Computer to bring up a Windows Explorer window. Use the Folder Options menu to show or hide hidden items. 4. To view hidden files, under the Advanced Settings menu look for 'Hidden Files and Folders'. 5. 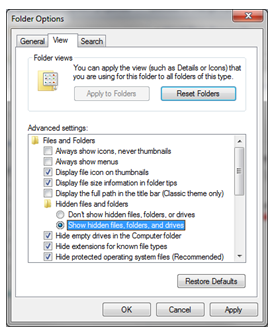 Click the radio button for Show hidden files, folders, and drives. 6. To view hidden file extensions, under Advanced Settings uncheck the box for Hide extensions for known file types.